The Widow (Emily Beecham), Waldo (Stephen Land), and Tilda (Ally Ioannides) ready to fight. Baron Chau (symbol: fox) is basically the go-to slave trader (with Cogs as her primary resource ). She has the largest cog population; we learn that The Widow grew up on her plantation. The Widow’s philosophy on life is basically the opposite of Chau’s, who believes in survival of the fittest. Later on, there is a fight among the Barons in the courtyard. Tilda (who came to The Conclave in secret) saves Waldo’s life. Quinn (Marton Csokas) faces off against Ryder (Oliver Stark). Were you a BIT surprised when Ryder hesitated to kill his father? Well, I wasn’t; he just doesn’t have the chops to fill his father’s position as Baron. I DID feel sorry for Jade- she really loved Ryder. Quinn (finally) killed Ryder; I thought it was going to happen much earlier (S1)! Also, I wanted to see more of the father-son showdown. As for Jade, I think she’s going to get major revenge on Quinn. NOTE: This review contains MILD SPOILERS for the first three hours of the series. Shots Fired is at its best when raising legitimate questions about the criminal justice system and attempting to answer them. But I don’t know if there is an answer. The dark overtones that envelope the show at times feel real and appropriate. For a topic this serious, darkness may be the only way to truly shed light on the gravity of the situation. …I am not surprised by the haters in the reviews here. To me, these are people that are stuck in their ways and are not trying to see the world through different sets of eyes. Blacks and others have had to watch MOST TV through white people’s eyes and they expect us to be happy for it. Now you have a show like this that is finally putting Black people in a humane and more realistic light and they can’t handle it. I’m Asian male [Vietnamese] that grew up in a working class neighborhood and episode 1 gave me goosebumps because it aligns so much with our reality. You probably thinking how can I say that when I’m an Asian male. Truth is, many of our struggles are similar to blacks in America. You may not know, but there is an Asian gang culture in every major cities in America due to the same reasons that make it hard for blacks to succeed in America. Any law enforcement officers in major cities can confirm this. 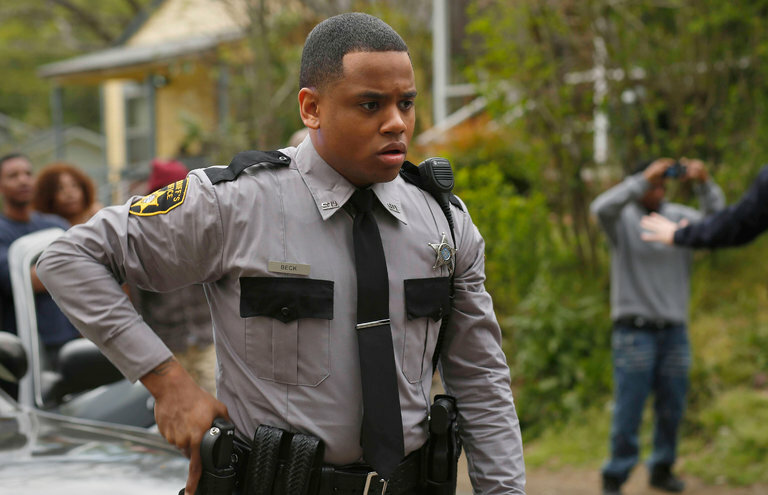 Deputy Joshua Beck (Mack Wilds) is the young cop and family man who becomes an outcast on the police force. Unnecessary police violence, particularly white cops against black offenders, is a topic that has everyone on edge. But, what happens when it’s a black cop that shoots an unarmed white kid based on racial profiling? The show centers on junior DOJ prosecutor, Preston Terry (Stephan James- who is Canadian and just 25 y.o. 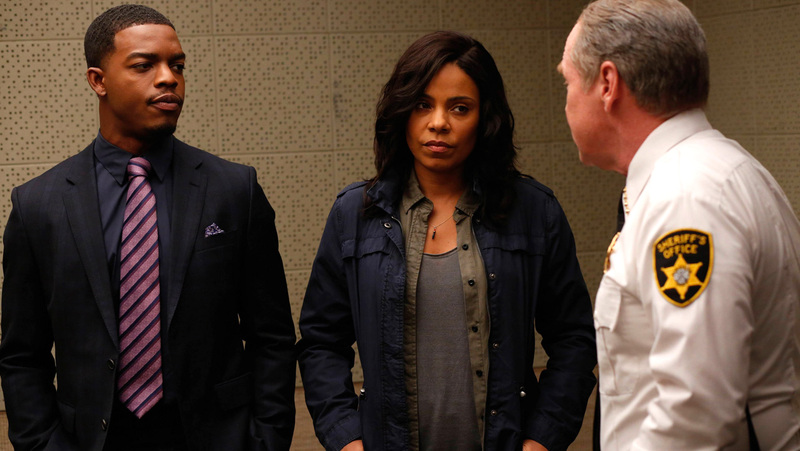 ), and investigator, Ashe Akino (Sanaa Lathan- daughter of a prolific Hollywood producer), who are sent to a small North Carolina town to investigate a police shooting. It’s much better, if a black officer (Deputy Joshua Beck- played by 28 y.o. Mack Wilds) is investigated and convicted by a black prosecutor, as one of Preston’s superiors in DC says in the first scene. Ashe and Terry dig deeper and find that an unarmed black kid was shot by a white officer not too long ago in the “houses”(projects) of this same town. Critics (and viewers) see a lot of potential in James; he definitely has that “It” factor (which an actor needs to get to leading man status). Don’t forget that a very young Blair Underwood played an attorney on L.A. Law in the ’80s. Wilds is doing pretty well in this role (never seen him before); the actor admitted that he never imagined himself in the shoes of a police officer before. He’s got an innocence and freshness about him- key for his role. What to say re: Sanaa Lathan? Hmm… well, she’s got youthful looks (even at age 45); her acting is not terrible, but pretty one-note. Governor Eamons (Helen Hunt) talks to press while her aide Sarah (Conor Leslie) and Preston (James) look on. Patricia Eamons (Helen Hunt) is the first female governor of the state; she was the one who decided to bring in the DOJ. Local pastor Janae James (Aisha Hinds) points out, after all the shootings of unarmed black men, why is this the case where the feds decide to get involved? Hinds’ outspoken activist, yet also spiritual, character is unlike most preachers we’ve seen on TV- female, youthful, and putting faith into action. Richard Dreyfus is introduced (near the end of the second hour); he is a 1st gen American businessman looking to advance a new prison/educational complex. I’ve seen three hours so far, but may keep w/ it (if the writing gets stronger and the veteran actors get more to do). So far, British actor Stephen Moyer (who plays Lt. Breeland) has just been a jerk. He may have brought some fans along w/ him from True Blood (never seen that show, so can’t judge). I’m waiting to see more of Will Patton (who plays the sheriff); he has a way w/ ambiguous characters. Jill Hennessy at the Sundance premiere of “Shots Fired.” I was very happy to see her back on network TV! We get to see Ashe and Preston in their private lives, unlike what you’ve seen in most Law and Order-type series. Speaking of that iconic TV show, the still stunning Jill Hennessy plays Alicia Carr, the heartbroken mother of the white college student. She gets a chance to shine in the third hour. Preston, who could’ve been a professional baseball player, is trying to earn the respect of his father (Dennis Haysbert) and older brother, (a pro football player). Ashe is a woman with serious anger issues, trying to keep primary custody of her daughter. Her Latino ex-boyfriend is planning to marry (a younger Latina woman) and raise their daughter full-time. Sunny and Bajie (still chained together) have to fight their way out of the pit. That huge/tall warrior they’re forced to fight ends up defeated in a VERY bloody way. Body parts are flying… and this ep is about to get MORE bloody! Waldo (Stephen Lang) passes on his knowledge to Tilda (Ally Ioannides). Waldo, now dressed in blue, chides Tilda re: going after those Clippers in E1 (after The Widow let them go). Tilda says that she’s NOT a “mindless killer”- she was doing what she thought was right. Waldo explains that Sunny was the best Regent b/c he “boxed up his feelings.” We can see the respect that Waldo has for his former protege, Sunny, while he’s recounting this story. Tilda and The Widow are practice fighting; it looks like Tilda still has more to learn. After Tilda leaves, The Widow admits to Waldo that she’s NOT one for politics; he tells her that “politics is war by other means.” They speak of an upcoming “conclave”- meeting of Barons. The Widow wonders if she can kill them all, since they’ll be assembled in the same place. She and Waldo drink a toast. The Totemist community’s simple wedding reception in the woods is interrupted by two violent/murderous Nomads. The groom is speared through the chest; the bride is almost carried off my the Nomads. Nobody fights back (which was quite shocking), except Lydia. This lady knows how to fight- what a surprise! This segment of the ep reminded me of Braveheart and Game of Thrones. Did you see how badly Ryder treated his mother!? I felt VERY bad for Lydia, though we now know she’s a tough cookie. Even though Ryder is now dressed like Quinn, he’s NOT able to fill his father’s shoes (as many viewers have commented). The Nomads attacked b/c they knew that Quinn was out of the picture, so the Totemists were left unprotected. Lydia hoped that Ryder would help out her people, BUT he refused in such a nasty manner. He didn’t forgive her for what she said re: his ineffectiveness at the end of S1. MK (Aramis Knight) learns about a new part of his training from The Master (Chipo Chung). The Master continues MK’s training, this time is a room filled w/ mirrors. The young man is pulled back into his past; he sees the bodies of the MANY people he killed on the ship. Suddenly, his alter ego appears (w/ black eyes) and tells him that he doesn’t belong there. MK is upset when The Master pulls him out of it. Later on, M.K. has an intense fight w/ his alter ego in another vision. There is some cool choreography. Also, the body double for Aramis Knight looks/moves VERY much like him. It was shocking that the alter ego was winning, nearly choking MK to death! Hmmm… will MK be defeated by “the dark side” or learn to reign-in those destructive urges? I don’t think this will be easy work from the looks of concern on The Master’s face. Quinn (Marton Csokas) training his (would-be) Clippers. In West Avalon (a secluded/underground training area) Quinn is working w/ a group of Cogs who show promise in fighting. Inside a dusty room, Veil is breastfeeding her newborn son; a Clipper is watching her intently (creepily). The former Baron notices this and let’s him know it. Veil tells Quinn that the baby needs sunshine and fresh air. He says he’ll get her sun; after all, she’s the one who found him and patched him up. Quinn gives off some creepy vibes in his interactions w/ Veil, too, BUT I think she can handle him w/ her clever/calm personality. It turns out that there is a little room where one can look up and see the sun! Quinn (Marton Csokas) holds a baptism ceremony for Henry, the baby son of Sunny and Veil. The Clipper who’d been eyeing Veil gets killed by Quinn before he baptizes Veil’s son (named Henry after her dead adopted father). There is a decorative bowl that Quinn drinks deer’s blood out of, then smears a bit of that blood on Henry’s forehead. This ritual reminded some viewers of the naming ceremony in The Lion King. Marton Csokas “just brings this intense gravitas,” as J.B. Zimmerman said on the Afterbuzz TV. At the very end of the ep, they come upon a long, tall wall. (Donald Trump would probably call it “big” and “beautiful.”) This barrier separates them from the Badlands, but Bajie perks up and says there MUST be a way to get to the other side. This scenery is quite different than what we saw in S1; the filming of S2 is in Ireland.